This episode we’re sipping on a Dark & Stormy in honor of our podcast mentor, Matthew Amster-Burton from Spilled Milk, while catching up. We share a few details from our week including a bit of a doggie disaster, and a sweet surprise from our favorite Canadian. We discuss these tips 7 Tips for Handling Criticism from Gretchen Rubin, author of The Happiness Project, and share a bit about how we each handle giving and receiving criticism personally and professionally. On a lighter note, we play a new game called, What’s in Your Purse? Spoiler alert...it’s hilarious. Kelsey is currently obsessed with the local library, and Erica can't stop with the ever controversial Cadbury Crème Egg. 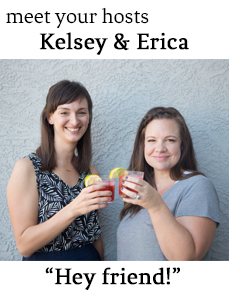 In Neighborhood News, Kelsey found a new happy hour buddy, and Erica feels judged by horses. Thanks so much for dropping in...until next time, be neighborly!